The second day of our week examining the recent performance of Sydney radio stations today looks at the #2 and #3 FM stations – both part of the Nova Entertainment offering. Breakfast with the legendary Bogart Torelli and the newshound Glenn Daniel offers a show unlike anything else in the market. Daniel has recently published his book News Time: A Life In Radio and I can confirm it is a cracking good read. Daniel was promoting the book at the smooth Festival Of Chocolate on the weekend and he is donating earnings to the Cardiac Research Unit at Royal Prince Alfred Hospital. “We have never stopped plugging away with smooth, we have been extremely consistent and we have had massive cumes this year,” he told Mediaweek. “You sometimes worry that the cumes are so high that it could affect the shares. We have about 250,000 more listeners than WSFM. The station is so big and so broad and we need to find the people who might have it as their second or third favourite station and get them locked on all the time. “Behind the scenes we have always felt good about it and the demos have been strong. The brand has come back to peak performance in both markets. “Product wise we haven’t changed anything, although we have tweaked the music just a bit. We have been trying to find more unique songs that the other stations aren’t playing. Over time other stations have moved a little closer to us [musically]. 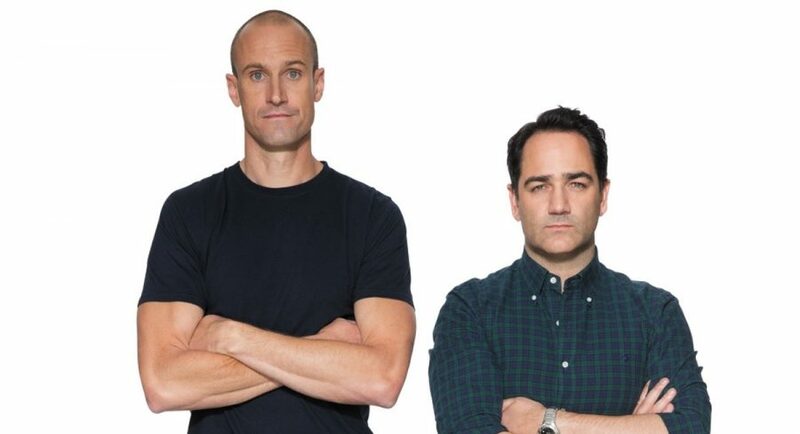 Fitzy and Wippa recorded their best-ever share in survey five. “We are not going off-air until Instagram corrects itself,” said Wippa this morning for the show’s army of social media users. The show is light on celebrity and heavy on relatable chat about the joys of everyday life. Other chat this morning included sleep problems and waiting for red lights. A key attraction for the regular listeners is the Six O’Clock Club, which only admits a few members each week. The club is not spoken about much and members don’t need to be too eager to get in. And if you try after 7am, forget it! “This is Fitzy and Wippa’s highest numbers. The greatest hits workday that we introduced at the end of June has connected with the audience and it has displaced 2Day and also affected KIIS,” Jackson told Mediaweek. Jackson mentioned the key elements include the roles Sarah McGilvray and Tom Ivey play on the show. “It is not just Fitzy and Wippa, but a whole bunch of guys and girls around them as well. The audience can’t get enough at the moment. Jackson admitted it had been a challenging year for the brand musically with less pop hits and more urban songs. “We have been playing a lot more songs from the last five to 10 years, which can still sound very fresh and contemporary. Australia’s media agency market continues to deliver robust results, with the July 2018 ad spend figures representing the 11th consecutive period of growth as total bookings edged 0.5% higher to $542.3 million. The data continued to detail the ongoing changes in the media market, with metropolitan press growing ad spend in July by 1% – its first year-on-year increase since September 2014 – while total digital media bookings dipped 0.3%. Digital media also remains the most patchy in terms of advertising demand with social sites, for example, seeing ad spend soar 14.3% and pure play video sites growing agency bookings by 19.9% but spending to the programmatic market dipped 1.2%. Outdoor and radio media delivered record July results, up 8.8% and 3.1% respectively, while cinema reported the only double-digit increase of any major media, up 13%. While metropolitan TV continued to attract more agency bookings with the total growing 2.7% for the month, softer demand in regional and subscription TV resulted in the overall TV spend slipping 0.5%. SMI AU/NZ managing director Jane Ractliffe said the results underscore the resilience of the Australian media given the ongoing overall market growth despite large changes in the media plans of large product categories. “We’ve seen this year good consistency from key media such as outdoor, radio and metropolitan TV but among many other media sectors there are large changes in share allocations from categories that are having a big influence on which media deliver growth each month,” she said. 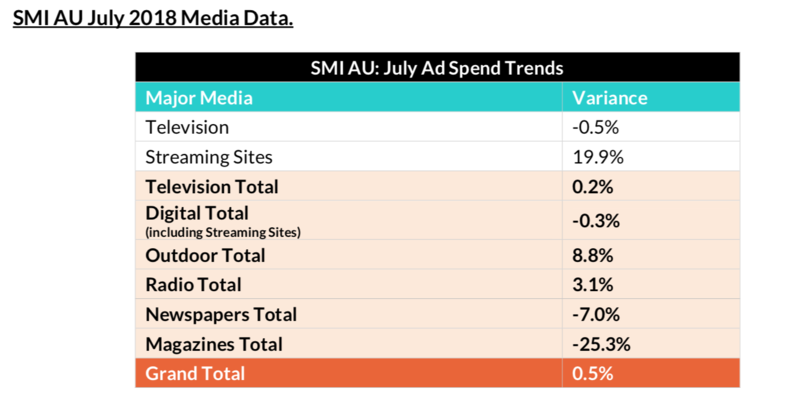 SMI’s ad spend data for the calendar year-to-date continues to also show the market to be strongly in front, with total ad spend up 4.9% to $4.105 billion – the first time it has ever broken through the $4 billion mark seven months into a new calendar year. This month SMI welcomed two new agencies to the SMI AU data pool – Cummins & Partners and Atomic 212. TEN pays over the odds for one of sport’s biggest trophies? The Victoria Racing Club (VRC ) and Network Ten have entered a new five-year agreement for $100 million, the biggest in the VRC’s history. 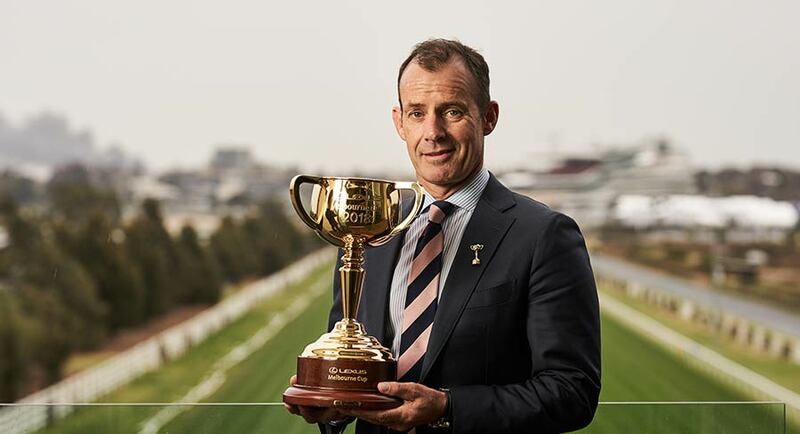 The partnership deal, effective from 2019 to 2023, comprises a suite of Melbourne Cup Carnival media rights, including free-to-air TV, internet, social media, mobile, OTT (Over-The-Top) and HbbTV (Hybrid Broadcast Broadband TV) within Australia. Under the new arrangement Ten will broadcast the four days of the Melbourne Cup Carnival live – AAMI Victoria Derby Day, Lexus Melbourne Cup Day, Kennedy Oaks Day, and Seppelt Wines Stakes Day. Ten has also agreed to terms with Racing.com to provide live coverage of all races across the Melbourne Cup Carnival on its channels and the Racing.com app. The live vision streaming rights for Wagering Service Providers are excluded from the deal with Ten. The broadcaster previously held the television rights to the Melbourne Cup Carnival for 24 years from 1978 until 2001. Outside Melbourne Cup Carnival, Group 1 racing from Flemington can continue to be viewed on Seven until at least the end of June 2020. 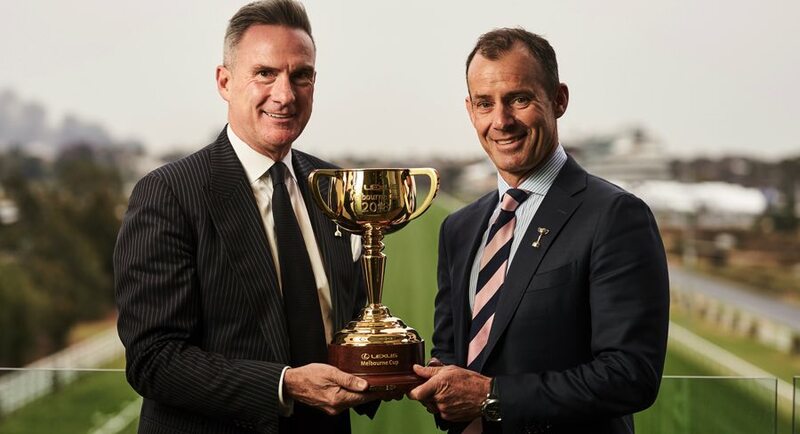 Ten CEO Paul Anderson said: “We are extremely excited that the Melbourne Cup Carnival is coming home to Network Ten. Our Network has a rich history with this world-class event having been the broadcaster of the race that stops a nation for over two decades. 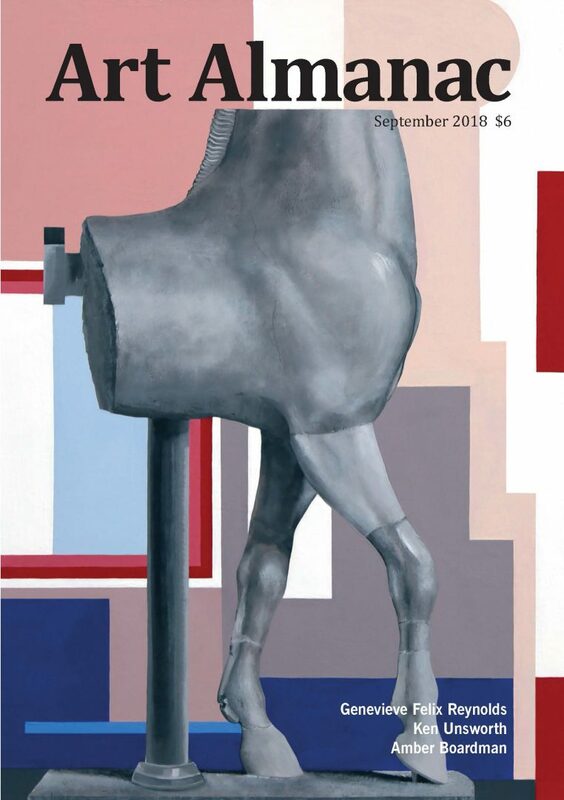 The Melbourne Cup Carnival is one of the most prestigious horseracing events in the world, and Cup Day is iconic, not just in the sporting calendar, but for all Australians. Paul Anderson: What did the VRC see at TEN that CA ignored? • What did the VRC in Ten see that Cricket Australian couldn’t? Some of the speculation around Ten Network’s $100m Melbourne Cup Carnival deal suggested that the broadcaster has possibly paid too much. Mediaweek asked Network Ten CEO Paul Anderson if he needed this badly enough to pay over the odds. “Some of those comments have come from our competition [Seven Network], which has missed out. We don’t feel we have paid too much. “This is one of the most prestigious events on the calendar. In terms of horse racing, this is really the jewel in the crown. “It gives us the opportunity to play in a range of advertising spaces where we haven’t had a big presence in a meaningful way previously. Ten’s recently appointed head of sport Matt White told Mediaweek how keen the broadcaster was to rebuild a solid stable of sports content. This goes a long way to getting Ten back in the game. “It certainly does,” agreed Anderson. Seven hasn’t completely missed out – its Racing.com subsidiary has acquired rights to screen live coverage of all races on its channels and the Racing.com app. Racing.com pays Network Ten for those rights. After Ten went very close to acquiring cricket rights earlier this year, Mediaweek asked Anderson what the VRC saw in Ten that Cricket Australia passed on. “Very good question,” he said. “The VRC has its own strategy to grow its Carnival outside of the sport. That is becoming a trend for a lot of sports these days. They want to grow through entertainment, through fashion and many things that are ancillary to the horse racing carnival. They have had the courage to chase their strategy and do something different. Pacific Star Network yesterday announced an agreement to sell the business of Morrison Media Services to nextmedia. The Morrison titles formed part of the company’s publishing division, which was responsible for non-sport related publications including Frankie magazine and Smith Journal. Pacific Star said the sale follows a strategic review of the company’s publishing assets and related opportunities. The total sale consideration is $2.4 million cash less working capital adjustments. The amount is payable 70% on settlement and 30% on June 30, 2019. The sale represents a multiple of approximately 3.2x FY18 EBITDA. Craig Hutchison, managing director of Pacific Star, said: “Since announcing the merger with Crocmedia in January 2018, we have undertaken numerous operational and financial initiatives. The sale of Morrison aligns with the continued expansion of our ‘Whole of Sport’ offering. Publishing remains core to our ‘Whole of Sport’ offering. Our recent acquisition of the AFL Publishing business, responsible for the iconic AFL Record publication, complements our broader suite of sporting assets. Settlement and completion of the sale are subject to customary conditions precedent being satisfied, expected to occur by mid-September 2018. 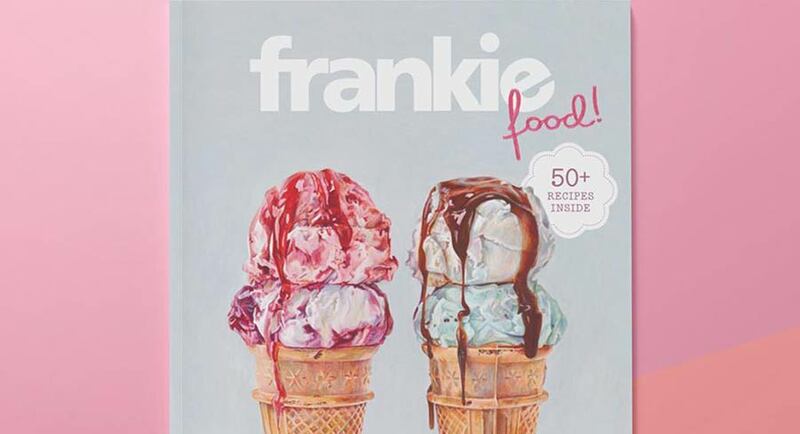 The announcement coincided with the publication yesterday of a special food edition of Frankie magazine. The Meg spends its first week in the Australian box office outside of the top spot as it slides to second behind Crazy Rich Asians. After a few flat weekends in cinemas recently the box office saw an 11% increase as it brought home $12.24m. Mark Wahlberg vehicle Mile 22 debuts at #3 while horror flick Slender Man drops out of the top five. Incredibles 2 has continued its super run as it has added $115,073 to its monster total, now 45.54m in fifteenth spot. A big reason why the box office had an 11% increase on last weekend was the first major Hollywood film to feature a predominantly Asian-American cast more than tripling its preview total, and more than doubling what The Meg made in the top spot last week. This was helped by more than doubling the screens it was shown on from 215 to 477, which provided a whopping average of $10,940. Staying in the top two after three weeks in cinemas, the film about a megalodon shark from the Cenozoic Era has brought its total to $8.35m through 318 screens with an average of $3,930. The fourth collaboration between director Peter Berg and star Wahlberg, after Lone Survivor, Deepwater Horizon, and Patriots Day, opened its first weekend in Australia cinemas with an average of $5,265 per screen, the second highest average of the weekend. Book club remains in the top five for the second week as it logs consecutive $1 million-plus weekends. While its overall box office declined by 18% its number of screens increased as it brought home an average of $3,917. Hanging onto its spot in the top five for the fifth week in a row Mission: Impossible – Fallout continues to show staying power. Despite a 25% decrease in its box office it still made an average of $3,822 across 235 screens to bring its total to a robust 17.99m. 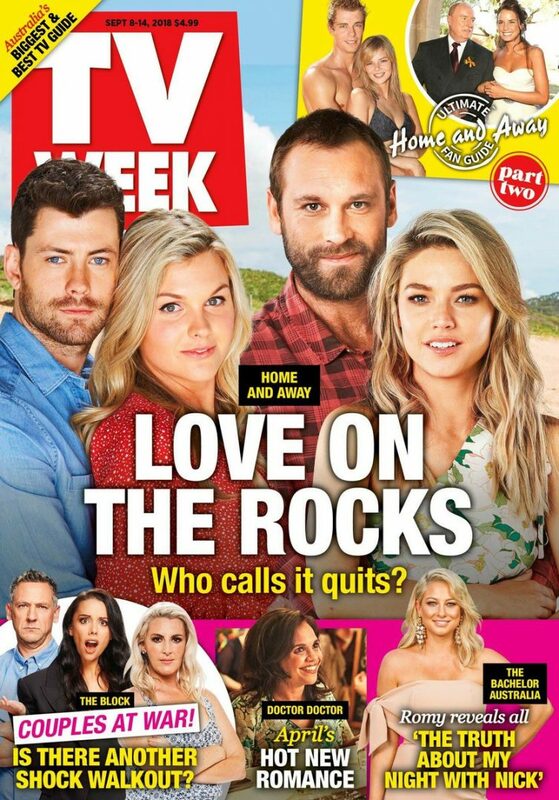 Home and Away started the week on 691,000, better than any audience last week and well up on the week 35 average of 577,000. For Seven it was all about the launch of Take Me Out last night, which ticked a lot of boxes – great funny host, big shiny set and loads of attractive contestants. It has yet to tick the ratings box though, but a debut of 604,000 means it wasn’t too far from third place in the timeslot. The good news is the debut helped Seven to its best Monday share in four weeks. However, looking longer term this year, the episode was down on its Monday average audience and share. The program moved at a good pace and by 7.50pm viewers had seen the pairing of the first couple. Seven then went with Gordon Ramsay early in the night with 262,000 watching 24 Hours To Hell And Back. 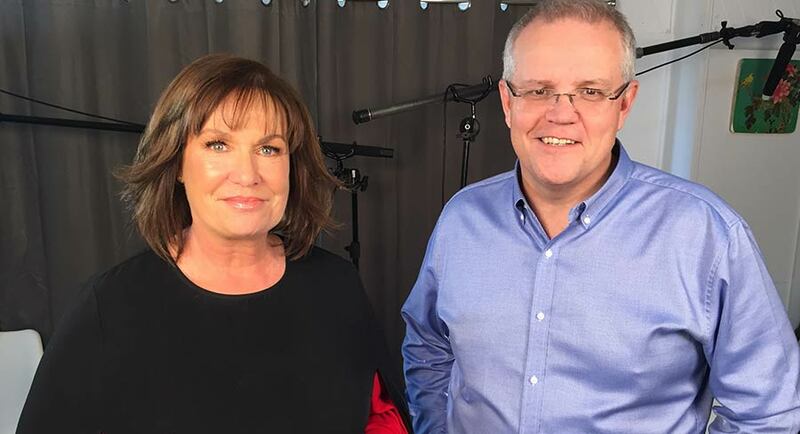 A Current Affair featured an interview with new prime minister Scott Morrison with Tracy Grimshaw visiting his Sydney home. The segment was pushed back in the episode with Steve Marshall leading with a story about a fake dad fiasco. The packed episode did 828,000 after an average last week of 723,000. The Block followed with the Blockheads getting worked up about a proposed swimming pool. The Monday episode did 1.06m after 1.08m a week ago. The trailers for Doctor Doctor were making some pretty big claims about the episode this week and the audience responded with 647,000, an excellent number now for drama at this time of night. The Project featured Lawrence Mooney explaining how he will earn a living now that Malcolm Turnbull is no longer leader and is quitting the parliament. The episode did 554,000 after a week 35 average of 514,000 after 7pm. 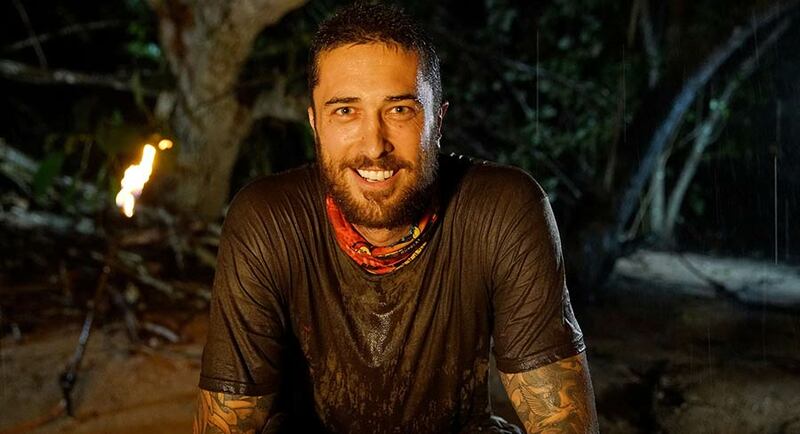 Australian Survivor featured another memorable tribal council with the wonderful Queensland builder Heath blindsided and sent home. With 12 left, could Benji really go all the way? The Monday episode did 640,000 after 674,000 a week ago. Have You Been Paying Attention? laid on the big names last night with Jane Kennedy, Glenn Robbins and Celia Pacquola joining Ed and Sam. The episode did 774,000, down a little on last week’s 800,000. That was still enough to easily win the timeslot and to rank #2 25-54 for the night. Another remarkable life was chronicled on Australian Story – from a homeless alcoholic living in the wild to his academic success, the program told the inspiring comeback story of forest-dweller Gregory Smith. The audience was on 694,000 after 642,000 last week. Four Corners host Sarah Ferguson interviewed Steve Bannon last night with 598,000 watching. 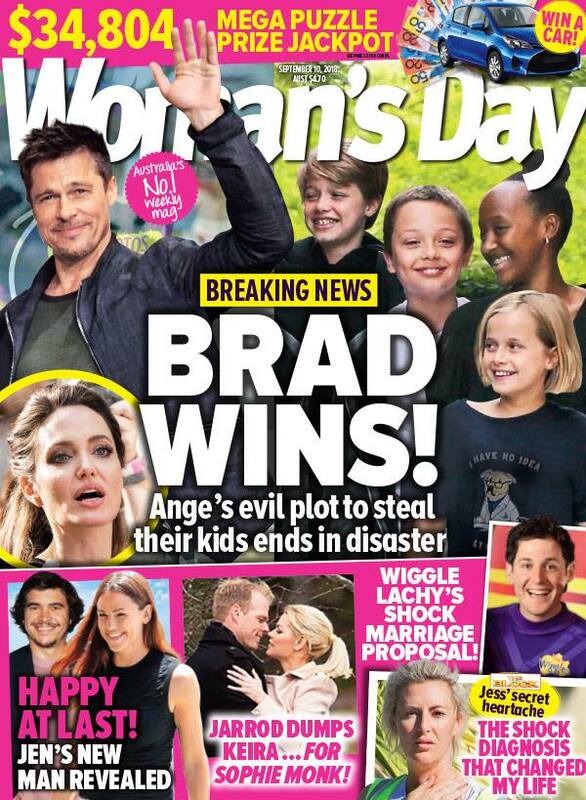 Media Watch then did 544,000 with an item about product placement on Neighbours. Alan Jones was amongst the guests on Q&A with 510,000 close to last week’s 516,000. A repeat of Empire Of The Tsars was the channel’s best with 205,000. Foxtel will hike the cost of its basic package for the first time in more than two years as the pay-TV business attempts to offset higher programming costs and heavier investment in new technology it has made to fend off rivals, reports The AFR’s Max Mason. The subscription TV business – 65% owned by News Corporation and 35% owned by Telstra – has informed its users it will lift the price of its basic service by 11.5%, or $3, from $26 to $29 per month. Subscribers have been informed the changes will come into effect from October 1. Foxtel’s platinum packs, which include all channels, will increase by $2 to $139 per month. The sports package, on top of the basic package, will remain at $29 per month. In February last year Foxtel increased the price of its sports package by 16%, or $4, to $29 per month. Netflix plans range between $9.99 per month for basic to $17.99 for premium, Stan ranges between $10 for basic and $15 for premium on a monthly basis, and pay TV service Fetch channel packages can be bought for $6 each per month, or $20 for all four of its premium channel packages. A Myanmar judge has found two Reuters journalists guilty of breaching a law on state secrets and sentenced them to seven years in prison, in a landmark case seen as a test of progress towards democracy in the Southeast Asian country, reports Reuters. Press freedom advocates, the United Nations, the European Union and countries including the United States, Canada and Australia had called for the journalists’ acquittal. 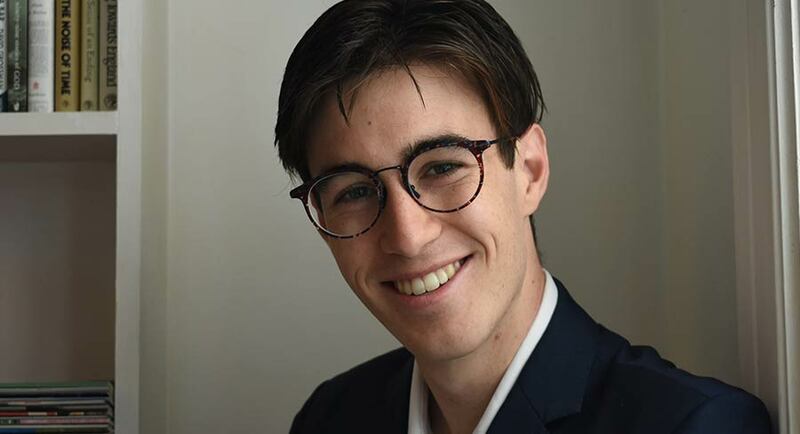 China has blocked access to the ABC after the country’s cyber security regulator claimed the broadcaster breached its internet laws, report The AFR’s Ronald Mizen and Michael Smith. 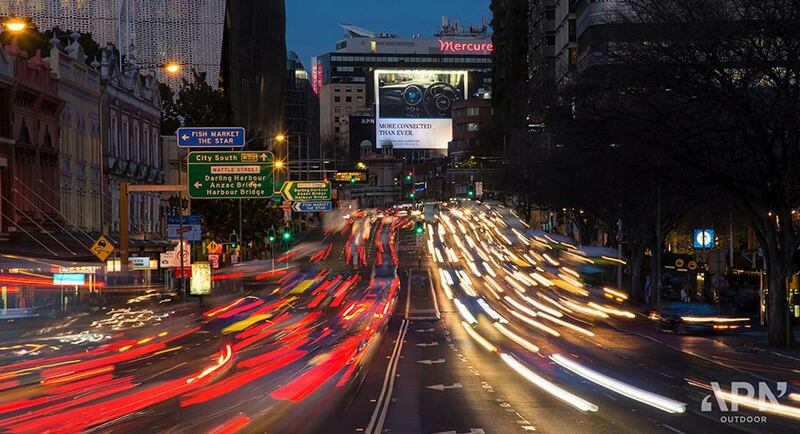 The move coincided with the Australian government’s announcement of new rules that stop Chinese telco Huawai from being involved in Australia’s 5G network. The ABC’s online presence, including its website and mobile apps, have been blocked by China’s “great firewall’ since August 22, according to the ABC, prompting the broadcaster to seek further information from Chinese authorities. Other Australian news websites remain available. 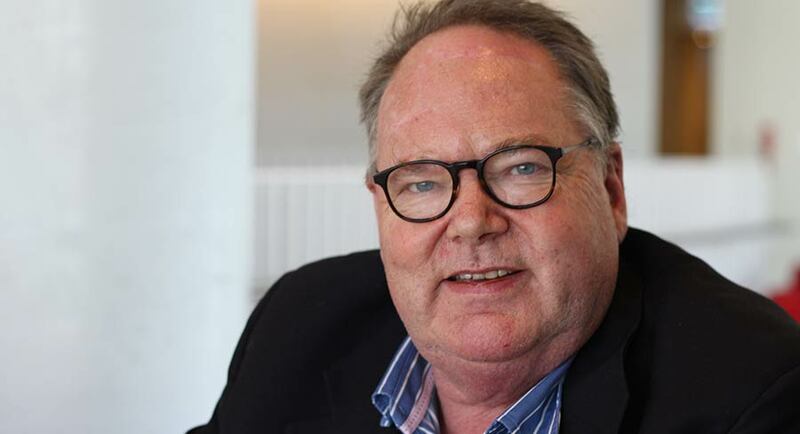 Future Publishing Australia (part of Future plc, the global media group), has acquired technology brands PC PowerPlay, Hyper and PC & Tech Authority from nextmedia. The acquisition of these titles will include the magazine portfolios, digital editions, Upgrade events and Australian PC Awards. The brands will join Future’s portfolio, which includes print and online brands APC, TechLife, TechRadar and PC Gamer. 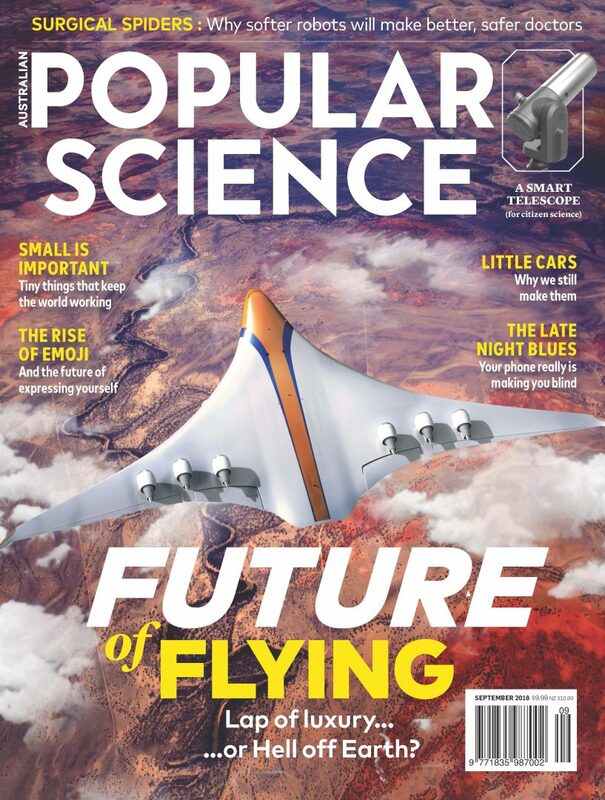 Following the acquisition, Future intends to consolidate PC & Tech Authority’s editorial expertise into APC – Australia’s longest-running and biggest-selling technology magazine. “PC PowerPlay and Hyper are incredibly strong brands in the Australian gaming community. These titles engage large, loyal audiences who are the influencers in Australia’s fast-growing gaming community. The titles perfectly complement our existing portfolio. Network Ten is starting its marketing campaign for another new show – the latest from TV Week Gold Logie award-winner Grant Denyer. 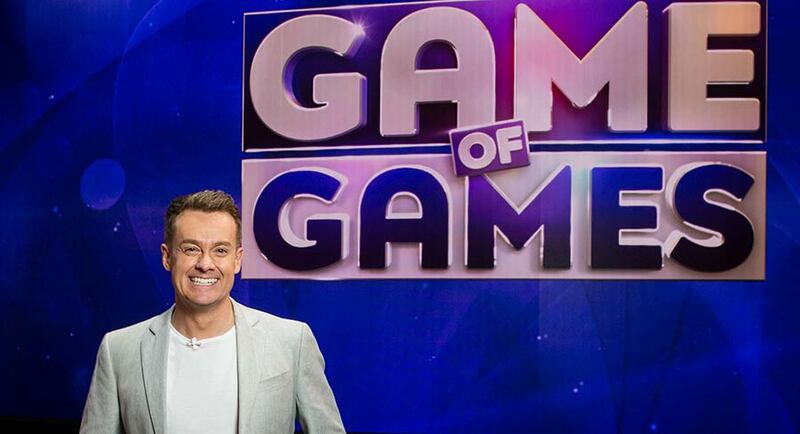 His new entertainment show Game of Games is coming soon to the Ten and WIN Networks. The new format features Denyer and a host of everyday Australians answering questions under crushing pressure as they have to manoeuvre through massive obstacles and face gigantic plunges into the unknown. Moving through several rounds, contestants must put their bodies, and their dignity, on the line for the chance to win a big cash prize. Originating as a segment on the US daytime talk show, The Ellen DeGeneres Show, Game of Games is being labelled the perfect light-hearted antidote to a serious week. Cassandra Thorburn has appeared on TV for the first time since the high-profile breakdown of her marriage to Today host Karl Stefanovic two years ago, reports news.com.au. Thorburn, 47, and Stefanovic, 44, announced their split in September 2016 after 21 years and three kids together. Although the former TV producer-turned-author has been scathing about her ex-husband and his new relationship with fiancée Jasmine Yarbrough in the past, she chose to steer clear of the topic during her interview on Seven’s The Morning Show. Spruiking her new children’s book, Leo Lion’s BIG Bed!, Thorburn said that she’d been looking for something to do with her newfound spare time. ARN and Chemist Warehouse have launched an all-new Chemist Warehouse REMIX station featuring a combination of national news, sport, weather and music’s freshest hits, with hosts Brendon “Whippy” Dangar and Zoe Sheridan (pictured). Chemist Warehouse REMIX is the first in-store and DAB+ combined radio station to offer national news, sport and weather to listeners, which will be updated hourly from 7am to 10am and 3pm to 6pm weekdays. The DAB+ station will also include favourite songs and fresh hits every day. 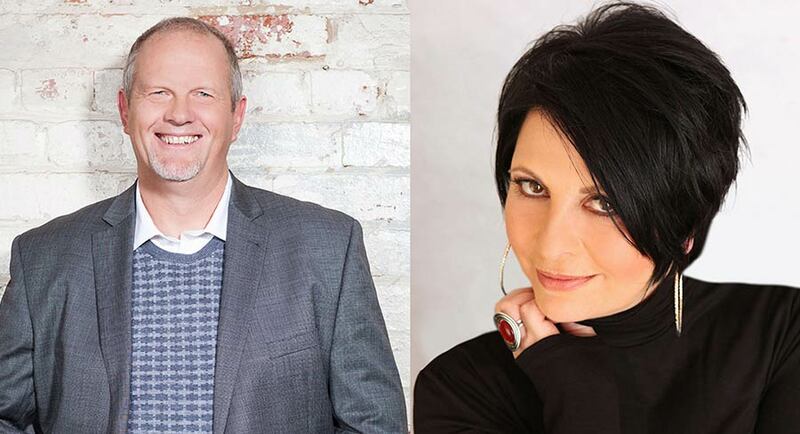 Like broadcast radio, the Breakfast Show, Workday and Drive Shows across weekdays will be hosted by experienced and established announcers, Whippy and Zoe Sheridan. 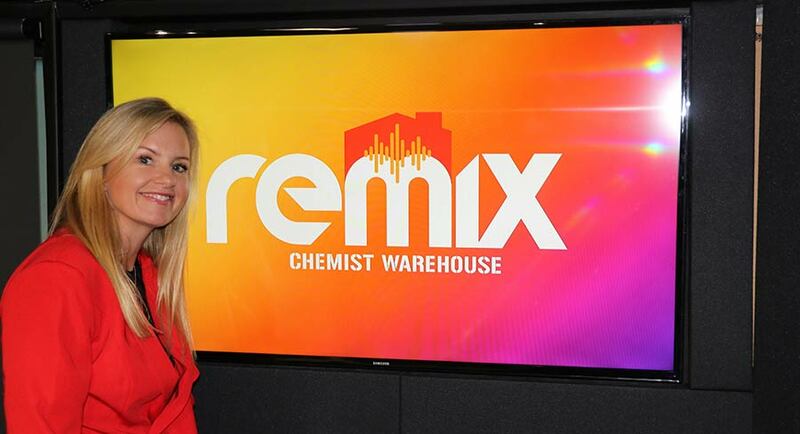 Chemist Warehouse REMIX is set to reach approximately 1.8 million customers every week across more than 400 Chemist Warehouse stores nationally and will also be heard on iHeartRadio and DAB+. Chris Evans is to leave BBC Radio 2’s flagship breakfast show and move to News Corp’s Virgin Radio, ending a lengthy association with the broadcaster after the ongoing dispute over high pay paved the way for him to be poached by a commercial rival, reports The Guardian. Evans’s departure to a Rupert Murdoch-owned radio station tests the limits of the BBC’s ability to hold on to its biggest stars after new rules forced the disclosure of leading presenters’ pay. His exit to a deep-pocketed commercial rival follows that of Radio 4 presenter Eddie Mair, who has left to join LBC. It is thought Evans was unhappy with the very public criticism of his pay packet and BBC chiefs struggled to match his demands during recent negotiations. They have privately raised concerns that the media attention on pay disclosures will put talent off joining the broadcaster, although there are no major concerns that other stars are about to leave the corporation. He will present his final Radio 2 show in December, 13 years after presenting his first show for the station. Speculation over his replacement has focused on Sara Cox, another former Radio 1 breakfast show host, who currently presents a late-night program on Radio 2. The station currently has only one woman in its daytime lineup: Jo Whiley, who co-presents the drivetime program with Simon Mayo. Evans will take over the Virgin Radio breakfast show from the new year. The current version of the station was relaunched in March 2016 and recently bought by Murdoch’s News UK, under the leadership of the former Sun editor Rebekah Brooks. The company hopes to develop a major presence in British radio. Josie Brown is joining Tennis Australia in the new role of chief insights and marketing officer. “We are delighted to welcome Josie Brown to the team and believe she will help us grow our organisation’s customer focus and insights-driven decision making while expanding our brand presence across the globe,” Tennis Australia CEO Craig Tiley said. “Josie brings more than 20 years’ experience in the digital marketing arena to this new executive role, which will see her responsible for the overall execution of all marketing and brand strategies as well as ensuring Tennis Australia is at the forefront of data-aware decision making. In her current position as director of digital, APAC at J Walter Thompson, Brown has been responsible for driving significant digital growth for several international clients by becoming more consumer-centric businesses. Prior to joining JWT in 2011, she worked at Procter and Gamble as well as ninemsn and Lufthansa. “I’m thrilled to be joining Tennis Australia at an exciting time when technology is connecting fans to their tennis experiences in new ways,” Brown said. Brown is set to start in the role later this month. The Footy Show isn’t the only AFL television program in strife in 2018 – so is The Marngrook Footy Show, reports News Corp’s Colin Vickery. Creator and host Grant Hansen has lashed SBS after his show’s failed Wednesday night experiment this year. SBS decided to move The Marngrook Footy Show to Wednesdays when the AFL announced a raft of Thursday night matches – but the switch has been a disaster. Ratings dropped to as low as a dismal 5,000 viewers in Melbourne in recent times – a fraction of the numbers the program used to get. Hansen says he told SBS about the potentially dire impact of a Wednesday shift but his warnings went unheeded. “I’m not really (happy),” Hansen said. “It was an experiment and I was very loath to let it happen. I have ended up being proven right because our ratings have suffered dramatically this year. “It is very difficult to get anyone to watch footy shows on Wednesday nights.